In general, soil properties, including shear strength and hydraulic parameters, are characterised as a spatial variability. 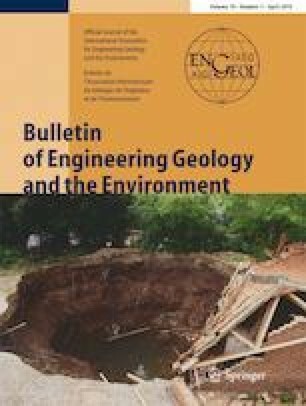 This paper aims to investigate the effect of spatial variability of the soil properties on slope stability during rainfall infiltration. The effective friction angle, saturated hydraulic conductivity, and soil water characteristic curve parameters of sand are simulated using random field theory. A seepage analysis is conducted using the random finite element method to obtain pore water pressure distribution. A stability analysis is performed to show the variation of safety factors and failure probability. The results show that the random field of the soil-water characteristic curve produces a significant variation of pore water pressure, while the random field of the effective friction angle is the most important parameter for probabilistic stability analysis. This research was supported by the Thailand Research Fund Grant No. DBG-6180004 and the Ratchadapisek Sompoch Endowment Fund (2019), Chulalongkorn University (762003-CC). The first author would like to acknowledge the Ratchadapisek Sompote Fund (2019) for Postdoctoral Fellowship, Chulalongkorn University. The second author would like to acknowledge the Royal Society-Newton Advanced Fellowship (NA170293).